30th Anniversary Event 30Y-30K at Really Big Coloring Books® $30,000.00 worth of Merchandise, Gifts, Prizes and Cash. “Free Public Event Saturday August 11th, 2018, 1PM TO 4PM held at The Center of Clayton located at 50 Gay Avenue, Clayton, MO 63105” Tickets available at the door - first come-first serve. Visit our Facebook page here to stay up to date! St. Louis, MO 07-19-2018: Really Big Coloring Books founded in 1988 is celebrating their 30th anniversary with participation from many business friends and associates. Free and open to the public, tickets are available at the door upon the event. Drawings will be held every few minutes, you must be present for attendance prizes, music by The Color Tones® band, including many booths from businesses around the St. Louis area. “Giving back to the community is what this is all about. It’s the talented dedicated employees that make your company successful. Celebrating and commemorating this 30 year anniversary is as much about the future as it is honoring the past. Saying thank you will never be enough,’ states Wayne Bell publisher. 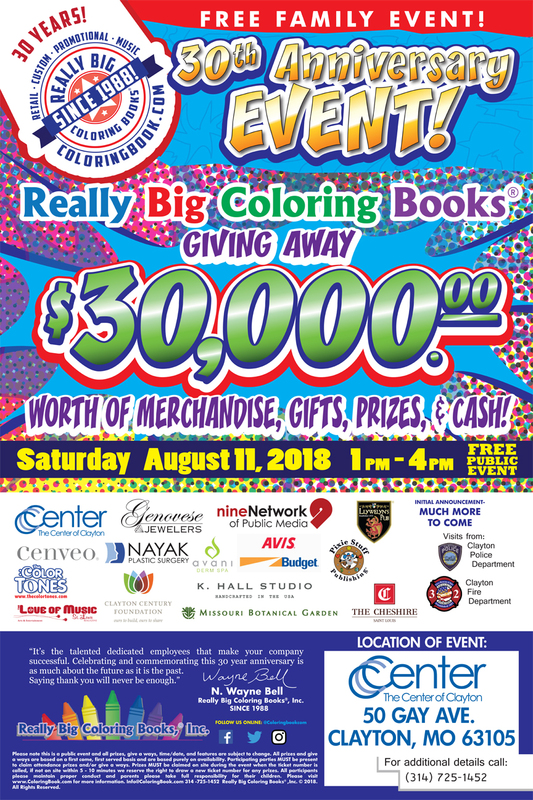 The event is open from 1PM to 4PM Saturday, tables are set up to give away thousands of coloring books, crayons, school supplies and gifts from Really Big Coloring Books and participating merchants. All to say thank you to the public and give back to the community. Really Big Coloring Books®, Inc., (RBCB) headquartered in St. Louis, MO, is a multi-national company providing quality adult and children’s teaching and learning tools, coloring book products for nearly three decades and publishes music. Known for their market leading positions the RBCB family of products are classic, colorful, unique and musical. The company owns more than 1500 coloring book and music related domain names in several countries and is called a trend-setting leader in children's publishing and the coloring book industry. 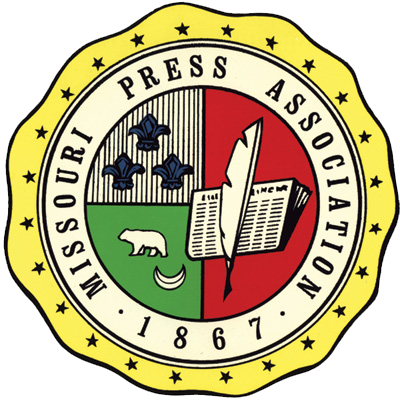 RBCB holds membership in numerous professional and trade organizations including The Missouri Press Association, System for Award Management for the U.S. Govt. 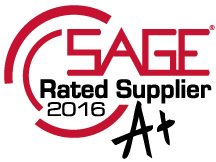 (SAM), SAGE, ASI, and PPAI, The International Book Publishers Assoc. 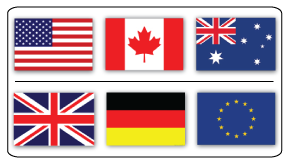 (IBPA) and other industry leading groups. Member of the Library of Congress Copyright Office in book and music publishing. Some participants include along with many others: Free Public Event with give-a-ways until gone. Please note this is a public event and all prizes, give a ways, time/date, and features are subject to change. All prizes and give a ways are based on a first come, first served basis and are based purely on availability. Participating parties MUST be present to claim any prizes and/or give a ways. Prizes MUST be claimed on site during the event when the ticket number is called, if not on site within 5 - 10 minutes we reserve the right to draw a new number for any prizes. All participants are expected to maintain proper conduct and all parents please take full responsibility for their children. 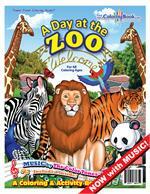 For more information: media@coloringbook.com or call 314-725-1452.